Your Trip Hazard Specialist will take precise measurements to know exactly where to start and end the cut. 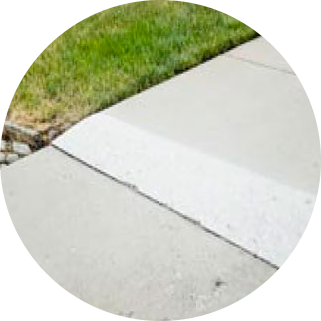 This ensures an ADA compliant slope of 1:12 on sidewalk panels and handicap accessible areas. 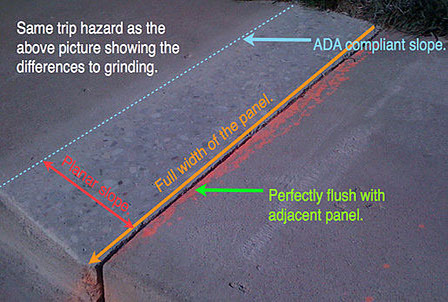 During cutting, your Trip Hazard Specialist will also ensure a zero differential between sidewalk panels. Notice that the cut surface has an OSHA Compliant Slip resistance greater or equal to the brushed finish on the adjacent panels. Our service is clean! All debris is collected and recycled to maintain a “green” solution to trip hazard removal and repair. As you can see, your Trip Hazard Specialist will continue to remove the hazard while maintaining an ADA Compliant slope and zero differential between sidewalk panels. 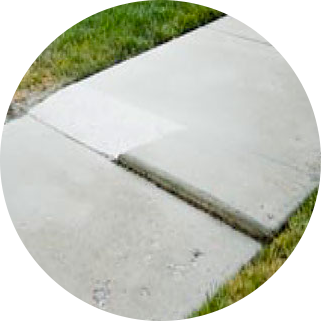 Concrete grinders and scabblers, while commercially available and less expensive than replacement or filling, are more costly than the Florida Sidewalk Solutions cutting method. 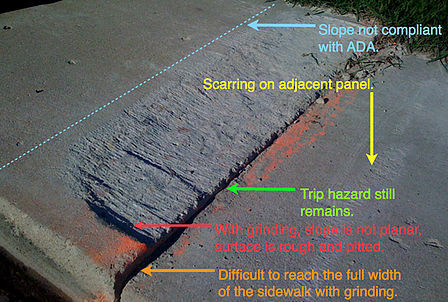 Grinders are also unable to reach the edges of the sidewalk or grind the sidewalk level with the next concrete panel, so the trip hazard often remains. 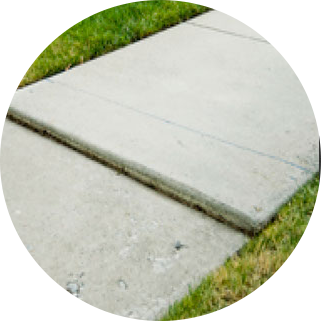 Not only can Florida Sidewalk Solutions reach the edges of every sidewalk, we can remove trip hazards from virtually any angle and at any location. 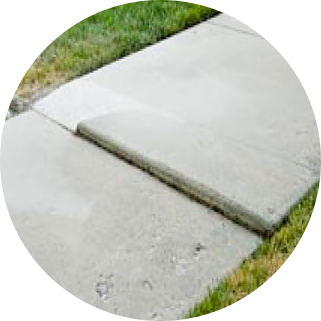 Trip hazards caused by cracked concrete or located in hard-to-reach places such as in gutters or adjacent to a wall will be eliminated without any damage to nearby impediments. Our method takes very little time, with few inconveniences to people using the walkway. The result is a safe, clean-cut walking path provided at a lower cost than any other method. Using patented technology, Florida Sidewalk Solutions removes tripping hazards from sidewalks rendering them not only ADA compliant but also virtually hazard free. FSS delivers the highest quality in the industry–across all facets of our business. Our patented horizontal saw-cutting technology completely and cleanly removes trip hazards from sidewalks, virtually eliminating claims that result from trips and falls on uneven sidewalk. 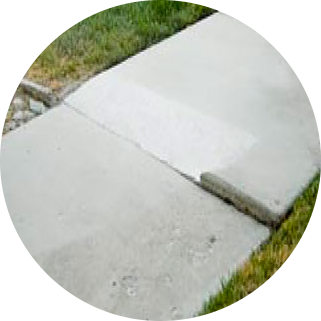 By having Florida Sidewalk Solutions remove their trip hazards, our clients reduce their legal liability using the most efficient and cost effective method available. Our service, unlike other approaches, accurately measures each offset to ensure that we achieve the slope required by ADA specifications. 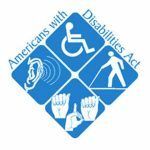 The only alternative available to achieve ADA compliance (if done correctly) is removal and replacement, which is costly, disruptive, and time consuming. Each offset will be tapered according to the specifications requested by the client and will have a uniform non-slip surface.